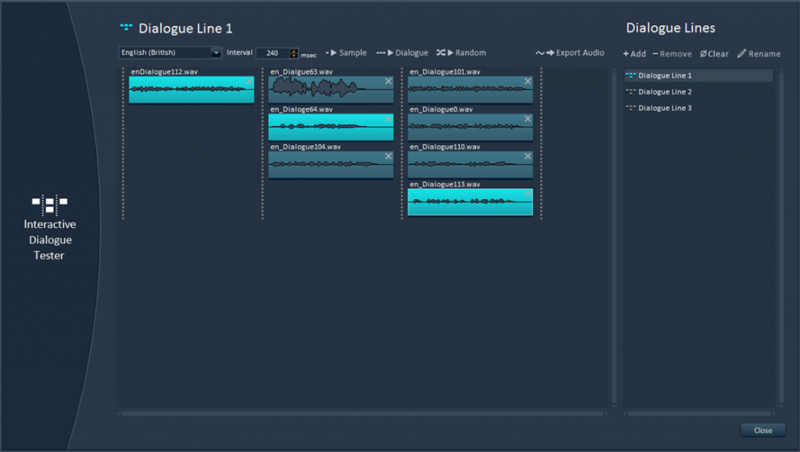 Tsugi recently released Alto Studio 3.1, an update to the leading audio dialogue tool packed with new features and improvements. 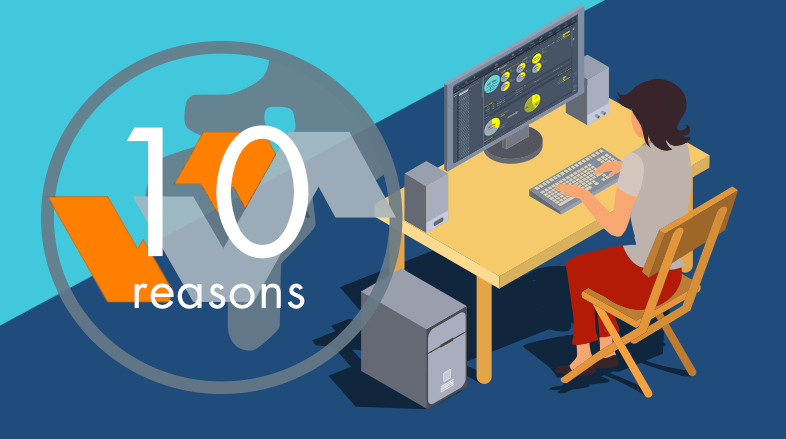 Here are 10 reasons why you too should be using Alto Studio! 1 – Flawless audio dialogue in no time! Whether you are a voice actor or a sound designer working in a game studio, post-production house or localization company Alto Studio’s unique features will help you deliver top-quality audio dialogue faster and cheaper to your team or your customers. Alto Studio offers automatic analysis and correction functions, as well as many batch-processing features. It also leverages multi-core architectures and its algorithms are highly optimized. Therefore, it is not rare for our clients (check our page to see some of them) to process hundreds of thousands of files at once, which rarely takes more than a couple of minutes! It is simply impossible to catch every mistake early and get this level of confidence in the quality of all your files without Alto Studio. Don’t be the one who left a bad wave file slip into the game! With Alto Studio, you can work with a simple set of files in a single language or compare files in several localized languages against the corresponding reference files. Alto Studio supports any file naming convention or file hierarchy. You can define the subfolders your files should be in, or what their prefixes and suffixes should be. 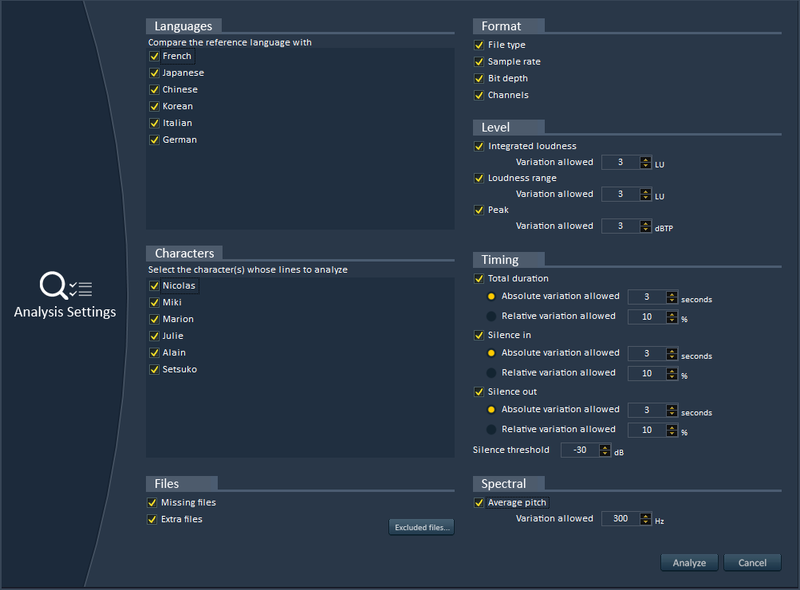 As for the languages, Alto Studio comes with useful presets for FIGS, ZPHR, CJK, PTB etc… but nothing prevents you from adding Klingon to the list if needed! You can import audio files directly from folders or from an Excel sheet. If this sheet also includes character names or script lines, they will be imported and you will be able to synthesize, analyse, correct and process files based on what character spoke them. 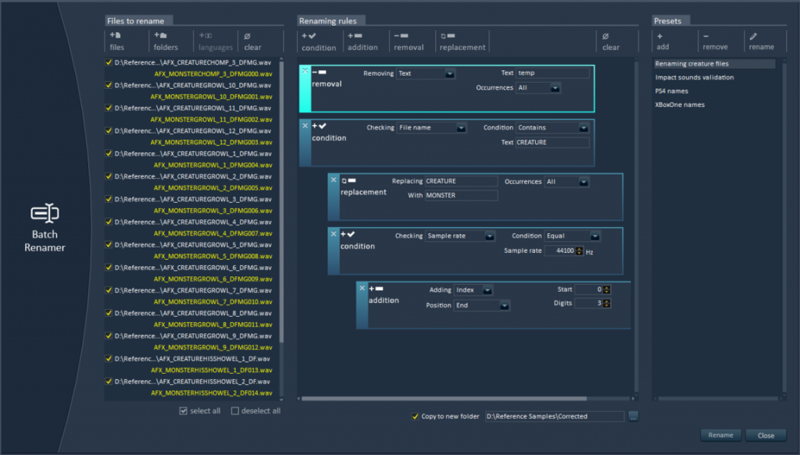 Alto Studio will analyse your dialogue files (or any sound file really), searching for any missing or extra data and any audio format errors (sample rate, bit-depth, number of channels). It will also check that the average and peak loudness, the duration, the leading and trailing silences are all within the margins of error you specified. You can even verify that the average pitch is in the same range! Alto Studio can correct the errors that were found automatically, saving you precious time. Of course, you can still choose to ignore some files or some types of errors. You can also indicate if you want the correction to hit the exact value of the reference or the nearest value in the valid range, in order to minimize the audio modifications. A better communication about the issues makes them easier and faster to fix. 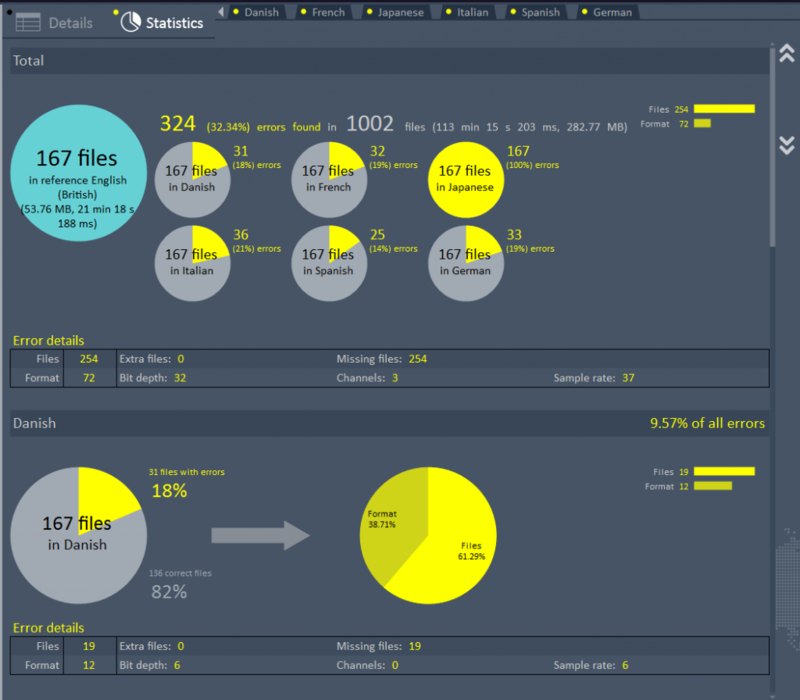 Alto Studio can generate exhaustive and great-looking reports for your team or your client. They can be consulted within the software or exported in PDF, HTML or as Excel sheet. They include all the errors found, statistics per language and more. Because most of the industry is now using Alto Studio, people know how to read these reports and have even come to expect one! Alto Studio is very easy to integrate with your existing pipeline. Working on a game? 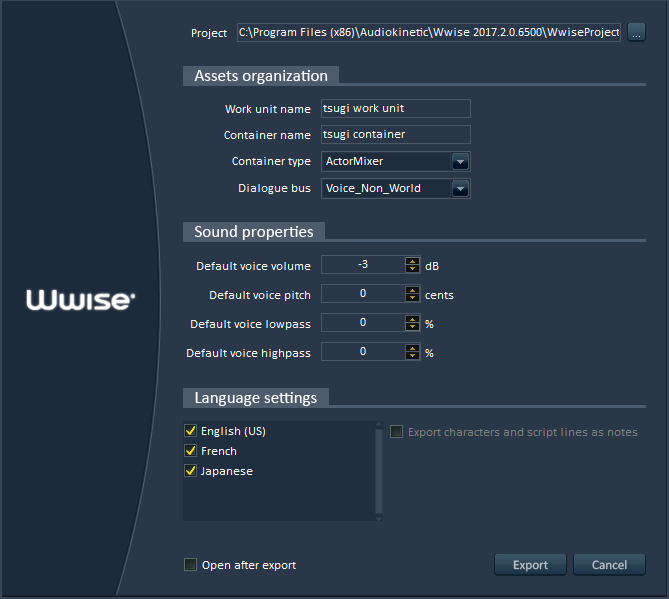 Alto Studio can import dialogue files directly from your game audio middleware (ADX2, Fabric, FMOD or Wwise) detecting the languages present and their settings. You can also export any Alto Studio project towards a game audio middleware. For example, in the case of Wwise, the wave files will be added to the project, the work unit created, containers of the right type generated and default parameters – such as volume, pitch, filters and bus – adjusted for the new Sound Voices. If the project contains script lines and character names, they will even be added as notes! The Alto Studio plug-in system allows you to interface with your proprietary tools and databases and its command line version can be called from your build pipeline or from a third-party tool. Please check our integration notes to learn more. Alto Studio has an absolutely fantastic batch renamer (really, try it…). You don’t need to have an Alto project open: just drop your files, add some renaming rules (conditional, additive, removal and replacement), press Rename and voilà! The batch renamer can handle very complex scenarios easily and can even rename files based on their audio characteristics (sample rate, channels etc. ), their author, their delivery date etc. 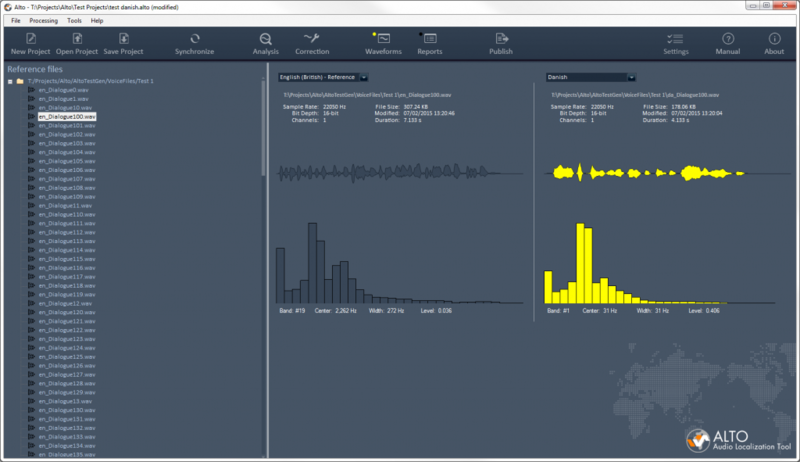 Open the loudness equalizer tool, drop your audio files (not necessarily dialogue!) from the Windows Explorer, enter a target LUFS value or get it by analysing a sound file and press Process! It’s that simple: all your files – maybe hundreds of thousands of them – are now at the right level. No need to fire up your game audio middleware or to ask an audio programmer: Alto Studio comes with its own function that allows you to test interactive dialogue, including randomization, gaps between sentences etc. 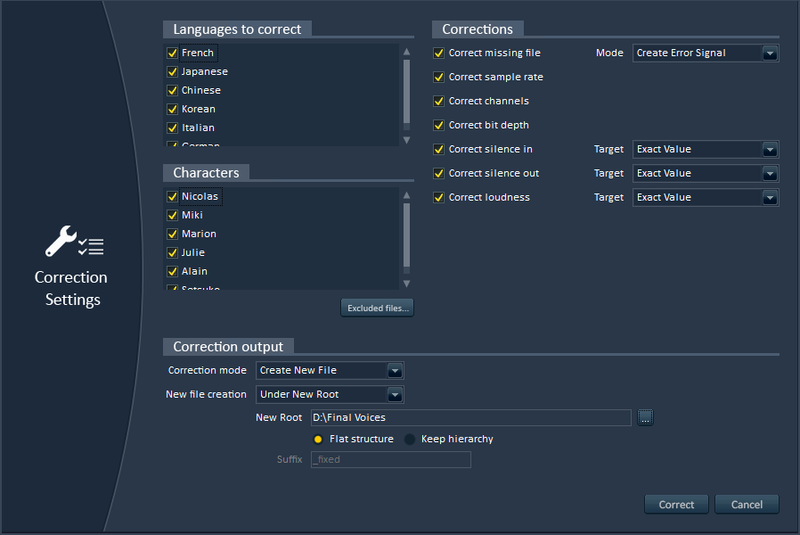 You can check how concatenated lines will sound, in different languages, in just a few clicks. You can even use this feature to test the sequencing of sound effects! 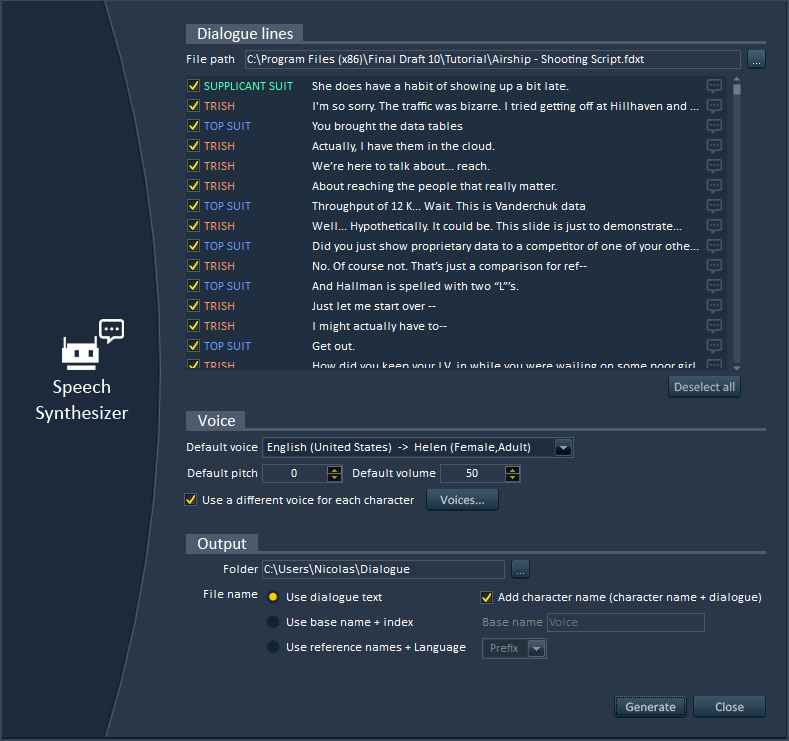 Thanks to Alto Studio’s speech synthesizer, you can instantly create placeholder dialogue and start the audio integration process earlier, without having to wait for the actual recordings. Import a Final Draft script, and Excel workbook or simple text file containing the lines to generate, select a voice in the right language for each character in the script and wave files will be generated for each dialogue line! There are many other unique features in Alto Studio that will make your life as an audio professional a lot easier, from audio batch processing in association with AudioBot to lipsync curves generation with FaceFX. But don’t take our word for it, download the free demo version and give it a try: http://www.tsugi-studio.com/web/en/products-alto.html.